Dennis the Menace is 60 years old. Both of them. By a twist of fate, two men on opposite sides of the Atlantic both had an idea for a young boy named Dennis and his dog getting in trouble with adults. 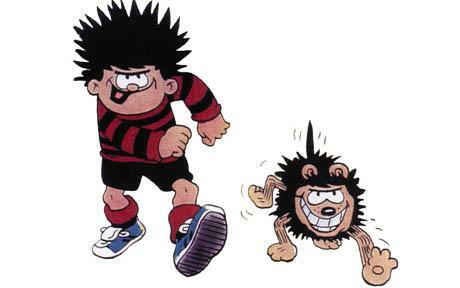 I had no idea that there was a British Dennis the Menace until I read the BBC article. Just looking at the characters, you get two very different impressions of the them. The American smiling while riding his dog Ruff. He looks happy. 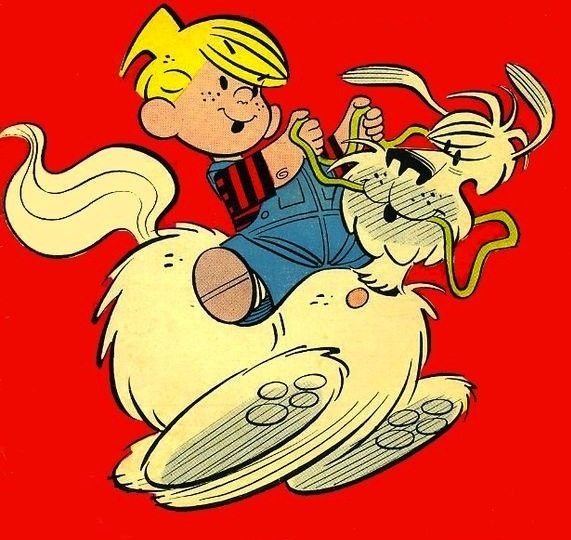 Sure, he’s “Dennis the Menace,” but you get the (correct) impression that while he may cause more than his fair share of problems, it’s because he’s too naive, ambitious, clumsy for his ideas. He doesn’t want to cause problems, they’re just unfortunate and unforeseen (to him) side effects. The British Dennis is also smiling, as is his dog Gnasher, but it’s unsettling. He looks like the kind of kid that would torture rats with hacksaw, and pull the wings of flies, before he feeds them to his dog in preparation for a fight. It’s not just this picture, it’s almost all of them. Of course, there’s no episode where the British Dennis mortally wounds a stray cat with an M80, but even watching an episode of the recent cartoon, left me with the impression that Dennis would eventually graduate to yob, and then later to full fledged football hooligan. This entry was posted in illustration and tagged a/b, comics, dennisthemenace on April 22, 2011 by jonathan.